December starts tomorrow, so bring on train season! Actually, it’s always train season around here because we are a toy train family. 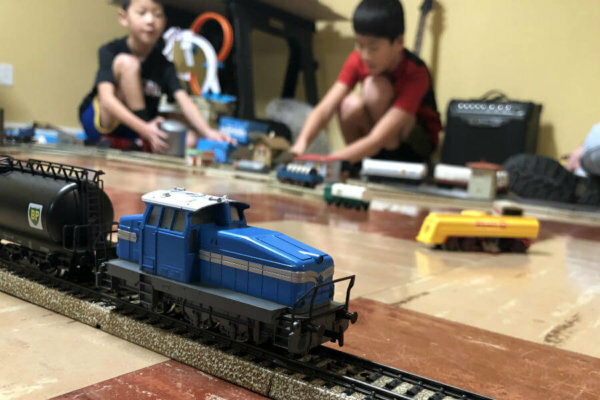 My husband and sons have been creating a Marklin train layout in our basement. Soon we’ll be gearing up to go see the Christmas train garden at the Shops at Kenilworth and maybe even a few others this season. 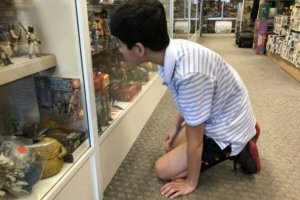 One of our favorites is the display at the Brandywine River Museum, but we only make that trip every couple years. I think we’re due for a trip. We had parent-teacher conferences this week, and I went in to meet with our sons’ teachers. Am I the only parent who gets emotional at those conferences? Seeing my children through others’ eyes and hearing about all they are achieving just brings me to tears. If that’s not normal, just move on to the third take. I never appreciated the challenge of December birthdays from the parents’ perspective until I found myself raising a child with a December birthday. My husband and I try to shop for both the birthday and for Christmas, but you can’t shop fully for Christmas because he might get the gifts you bought from other people on his birthday. And you don’t want any child to get too much, but you also don’t want him to have a disappointing birthday or Christmas. Somehow we muddle through, and it will be wonderful either way. Christmas, you know, doesn’t come from a store. But vintage Transformers do, and I do hope Santa has some way to get his hands on one. Our fifth grader is preparing to give a presentation while dressed as a colonist. One of the things I love about his school is that his teacher told the students not to order a costume. She said they could just wear whatever they have. So that’s what he’ll do. 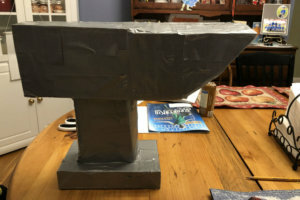 But he also wanted to create an anvil, so he took cardboard and tape and made the most amazing anvil. He makes me laugh when he takes it and drops it on his head like he’s Wile E. Coyote. I hope the anvil lasts until the presentation is complete. 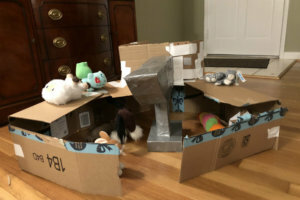 Once the boys had discovered the beauty of working with cardboard and duct tape they started building play structures for their stuffed animals. They made a castle for the animals to enjoy. It made me wonder why we aren’t just putting stacks of cardboard and duct tape under the Christmas tree. Of course, we would have to put the tree up first, and we aren’t in any rush to do that. That’s not for any moral reason or any commitment to living liturgically. It’s just that every year before we put up the tree, we reassess the whole living room and think about whether we should move the furniture around. So we can’t just jump into decorating. I love, love, love our house and never, ever want to move. But I do recall that when we looked at the house, I couldn’t see an obvious place for the tree—and that is still true. We went to a used furniture store as a family last weekend, and I marveled that we can do that now without worrying that someone will knock over an expensive vase. 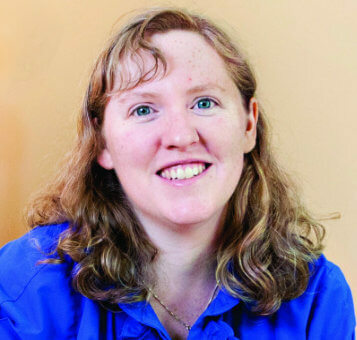 People mostly greet us with smiles, and our sons are curious about everything, so it seems to go fine. 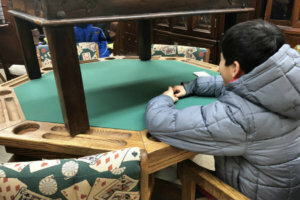 This time they found a poker table and got all excited. They are both devoted card players, and they could immediately see how much fun it would be to have a table just for playing cards. And it would be so much fun. We would just have to have a space to put that table. I’m not sure they’ll learn that lesson from me since I have been known to fall in love with pieces of furniture that don’t fit the room we have. We made it through the scheduled power outage for our neighborhood! We lost some food, but not as much as I thought we would because it wasn’t as long an outage as we had thought it would be. And my husband went through everything and got rid of expired food or anything questionable. It reminded me of when we were preparing for our health inspection for our home while we were preparing to adopt. 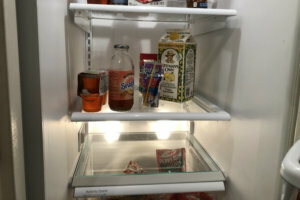 Now we have a fridge that looks as if it belongs to a bachelor. 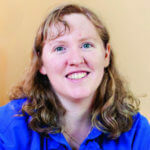 Read more quick takes at Kelly’s blog, This Ain’t the Lyceum, and have a wonderful weekend. Advent begins Sunday!